Recently Facebook has rolled out few new features that will enable the users to user their Facebook account with better sense of security. The newly introduced Secure Browsing feature allows users to always use secure connection(https) for Facebooking. While facebook were already using secure connection for their login sessions, regular user activity was not protected. Enabling Secure Browsing ensures that your data can't be seen by ISPs,your company Admins or other users. This is especially important in cases,where you are using Facebook from public computers or while surfing on an unencrypted wireless network. To enable Secure Browsing functionality in your account go to Account -> Account Settings -> Account Security. 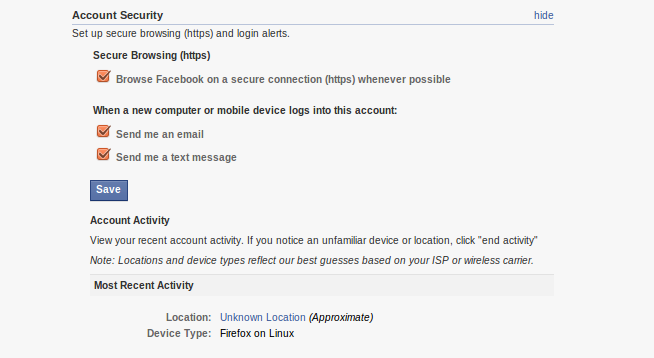 Check the option "Browse Facebook on a secure connection (https) whenever possible". From now onwards all your facebook conversations will be over https(you can verify this from the https:// prefix in the address bar). There are a few things you should keep in mind before deciding to enable HTTPS. Encrypted pages take longer to load, so you may notice that Facebook is slower using HTTPS. In addition, some Facebook features, including many third-party applications, are not currently supported in HTTPS. We'll be working hard to resolve these remaining issues. We are rolling this out slowly over the next few weeks, but you will be able to turn this feature on in your Account Settings soon. We hope to offer HTTPS as a default whenever you are using Facebook sometime in the future. Two more useful features are also available now, Login alerts and Activity viewer. Login alerts will send you login notifications to your email or phone(if you have added a mobile device to your account) when a login occurs from an unknown computer.This will act as a early warning in case somebody tries to access you account. Activity monitor will let you check the recent activities happened in you account, how many logins happened in the recent past,how many sessions are still open.If you finds that there is any unauthorised activity in you account, there is an option to end that particular session also.